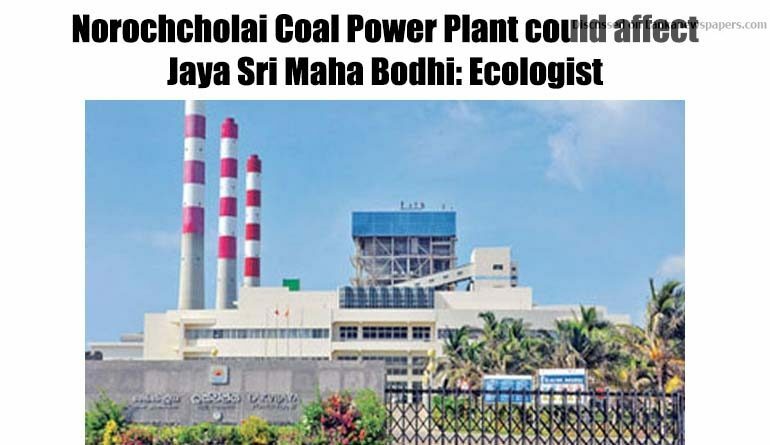 The toxic acids evaporated from the Norochcholai Coal Power Plant could pose a threat to the Jaya Sri Maha Bodhi, the oldest living tree of the world with a written history, Ecologist Dr. Ranil Senanayake said today. Addressing a press conference organized by the Centre for Human Rights and Research (CHR), he said there is a possibility of clouds with toxic acid deposits travelling towards Anuradhapura where the sacred Bo tree (Fig tree) is standing, with the Southwest monsoon condition developing. He said when coal is burned, Sulfur (S), Sulfur dioxide (SO2) and Nitrogen oxide (NO) is emitted and heavy metal particles also released. These elements form acids such as Sulfuric acid (H₂SO₄) and Nitric acid (HNO3) which would reach the clouds through condensation. Dr. Senanayake said the condition had already affected the trees in the outskirts of the Norochcholai Coal Power Plant leading to grave environmental damages. He said that it can be observed that leaves of the tall trees have turned yellowish due to the emissions of these gases. “The unfortunate situation is that these clouds containing toxic acids travel towards Anuradhapura District. These clouds spread up to a radius of 6 to 6.5 km. The sacred Jaya Sri Maha Bodhi is within the range of these clouds and could pose a threat to it too,” he said. In addition, he said a acidic condition is also spreading towards the sea areas as a result. Therefore, rebuilding such harmful coal power plants in future is a threat to the Eco-system. Dr. Senanayake added that politicians and the officials had sacrificed one of the most revered Buddhist places worship for mere political gains. CHR Executive Director Keerthi Tennakoon and former Director (Alternative Energy) of the Ministry of Science and Technology, Engineer P. G. Joseph participated in the event.